This article is about the special municipality formerly known as Taoyuan County. For former county-administered Taoyuan City, see Taoyuan District. For the district in Kaohsiung, see Taoyuan District, Kaohsiung. 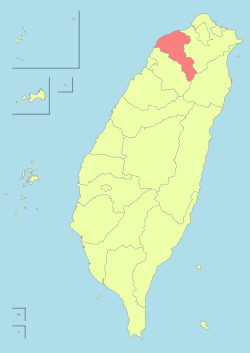 Taoyuan (Hokkien POJ: Thô-hn̂g; Hakka PFS: Thò-yèn) is a special municipality in northwestern Taiwan, neighboring New Taipei City, Hsinchu County, and Yilan County. Taoyuan District is the seat of the municipal government and which, along with Zhongli District, forms a large metropolitan area. Taoyuan developed from a satellite city of Taipei metropolitan area to become the fourth-largest metropolitan area, and fifth-largest populated city in Taiwan. Since commuting to the Taipei metropolitan area is easy, Taoyuan has seen the fastest population growth of all cities in Taiwan. ^ Refers to the Taipei-Taoyuan urban area. (video) Taoyuan, looking down from the air. "Taoyuan" means "peach garden" in Chinese, since the area used to have many peach trees. The city is home to many industrial parks and tech company headquarters. Taoyuan International Airport, which serves the capital, Taipei and the rest of northern Taiwan, is located in this city. The city of Taoyuan has been elevated to special municipality status since 2014 from the original Taoyuan County. At the same time, the former county-administered city of Taoyuan was also promoted to Taoyuan District within the new municipality. In ancient times, the Taoyuan plateau was the home of the Taiwanese plains aborigines. In prehistory, the Ketagalan people settled in Nankan [zh]. In the early years of Dutch colonization, Spanish colonization, and Zheng He of the Ming Dynasty, there were no large-scale cultivation or industrial activities. During the Qing era, a number of people from Fujian Province and Guangdong province began to immigrate into present-day Taoyuan to develop and farm the land. They planted peach trees, which, when fully bloomed in spring, were so beautiful that the people named the land Toahong (Chinese: 桃仔園; pinyin: Táozǐyuán; Pe̍h-ōe-jī: Thô-á-hn̂g; literally: 'peach orchard'). In November 1901, under Japanese rule, a local administrative office, Toshien Chō (Japanese: 桃仔園廳), was established in the area, and renamed Tōen Chō (桃園廳) in 1905. In 1920, the Tōen area was incorporated into Shinchiku Prefecture. During the Japanese era, the staged migration policy caused Taoyuan to develop into a city with a variety of cultures. For example, temples and worship paths (currently the Taoyuan Martyrs Shrine) symbolized cultural systems. Butokuden (武德殿) were used to represent military systems, and the old Taoyuan City Office signified political systems. 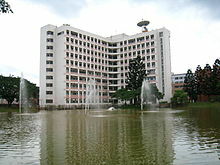 In 1950, Taoyuan County was established by the Republic of China government. On 21 April 1971, Taoyuan City was made the county seat of Taoyuan County. It had 6 cities, 1 urban township and 6 rural townships. Being located at the edge of the Greater Taipei region, this caused some structural and lifestyle changes within Taiwanese society. Trade prosperity in recent years and the proliferation of job opportunities helped Taoyuan develop into a major economic district in northern Taiwan and the population has increased ever since. On February 16, 1998, China Airlines Flight 676 crashed in Taoyaun City near Chiang Kai-shek International Airport (Taoyuan International Airport's former name), killing all 196 people on board and seven more on the ground. 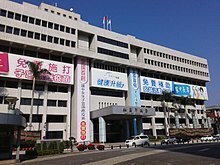 On December 25, 2014, Taoyuan County was reorganized into the special municipality of Taoyuan City (桃園市). Taoyuan is located approximately 40 km (25 mi) southwest of Taipei, in northern Taiwan, and occupies 1,220 km2 (470 sq mi). It is made up of low-lying plains, interconnected mountains and plateaus. Its shape has a long and narrow southeast-to-northwest trend, with the southeast in the Xueshan Range and the far end on the shores of the Taiwan Strait. There are many irrigation ponds at Taoyuan Plateau, which caused Taoyuan to earn the nickname "Thousand-pond Township" (千塘之鄉). Taoyuan has a humid subtropical climate, with mild to warm winters and hot summers, typical of northern Taiwan. As of the rest of Taiwan, the Hoklo are one of the largest ethnic groups of Taoyuan, most of whom live in northern Taoyuan (北桃園), which comprises most northern districts of the city, including Bade, Daxi, Dayuan, Guishan and Luzhu, and the city seat of government, Taoyuan District. The Hakka are the second-largest ethnic group in the city after the Hoklo, most of them residing in southern Taoyuan (南桃園), which includes Zhongli, Pingzhen, Yangmei, Longtan, Guanyin and Xinwu districts. With more than 785,000 Hakka people, Taoyuan hosts the largest Hakka population among all of Taiwan's administrative divisions. After the Chinese Civil War, many people from mainland China (unaffectionately referred to as "Waishengren") settled in the then-Taoyuan County after the retreat of the nationalist government in 1949. Most of them live in military dependents' villages in Zhongli, Pingzhen and Guishan. Longgang is well known for its immigrants from Yunnan, featuring many Yunnan-style restaurants. Most Taiwanese aborigines in the city live in Fuxing District, with most of them belonging to the Atayal people. Taoyuan is one of the Taiwan's top industrial and technological cities. High-tech companies including Quanta, MiTAC, Inotera, Nanya Technology, HTC, CPT and AU Optronics have all opted to build or expand their factories in Taoyuan. Taoyuan has now become a bastion of electronics and semiconductor manufacturing. Over 200 of Taiwan's top 500 manufacturing companies have factories in Taoyuan. Taoyuan has also led Taiwan in terms of industrial output for nine straight years. There are now 29 (registered) industrial areas with 3,696 ha (9,130 acres) of non-urban industrial land and 3,131 ha (7,740 acres) of urban industrial land. There are over 6,827 ha (16,870 acres) of land available for factories and industrial use in the city, representing the fact that Taoyuan's development bureau is based on industry and commerce. There are also 9 sites (57 ha; 140 acres) for mixed industrial-commercial use, the most of any county and city in Taiwan. On March 26, 2010, China Airlines moved into its new headquarters on the grounds of Taipei Taoyuan International Airport and in Dayuan Township in Taoyuan County (now Dayuan District, Taoyuan). EVA Air maintains its headquarters in Luzhu District. 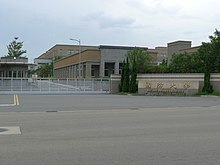 Evergreen Airlines Services Corporation, Evergreen Aviation Technologies Corp., and Evergreen Air Cargo Services Corporation, subsidiaries of Evergreen Group, are headquartered in Dayuan. On December 25, 2016, The Asia Silicon Valley Development Agency (ASVDA) was inaugurated in northern Taoyuan City, in a governmental effort to foster innovation, promote the Internet of Things (IoT) sector and attract top-class technology talent. The Asian Silicon Valley project aimed to transform Taiwan into an R&D hub for the IoT sector as well as a global center of entrepreneurship. Taoyuan City is divided into 12 municipal districts and 1 mountain indigenous district. 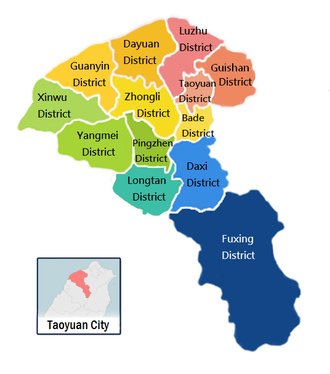 Prior to its upgrade to become municipality on 25 December 2014, Taoyuan County used to have 6 county-administered cities (Bade, Luzhu, Pingzhen, Taoyuan, Yangmei, Zhongli), 1 urban township (Daxi), 5 rural townships (Dayuan, Guanyin, Guishan, Longtan, Xinwu), and 1 Mountain indigenous township (Fuxing). Shihmen Reservoir (traditionally spelled "Shihmen") (石門水庫) is one of Taiwan's major reservoirs. Once the largest water conservancy project in Southeast Asia, visitors may find many restaurants open near the reservoir serving fresh reservoir fish delicacies. There is also a three-kilometre-long (1.9 mi) bikeway surrounding the back pond. Shimen Reservoir provides almost all of the water in Taoyuan, as well as to New Taipei City's Xinzhuang, Banqiao, and Linkou districts. Daxi Old Street is one of the more famous Taiwanese old streets. It used to be a bustling hub for camphor and the tea trade, filled with diverse stores with façades designed in a Baroque style. The street also has the Daxi Wood Art Ecomuseum, which includes buildings such as Daxi Butokuden and Lee Teng-fan's Ancient Residence. Cihu Mausoleum (慈湖陵寢) is the final resting place of the former president of the Republic of China, Chiang Kai-shek. The Window on China Theme Park (小人國主題樂園) is one of Taiwan's earliest theme parks, established in 1984. The park consists of three areas: Mini World, Water Park, and Amusement Park. The park features numerous small-scale replicas of many famous world landmarks. Lalashan (拉拉山) is one of Taiwan's "natural protection zones," including 500- to 2,800-year-old divine trees and the "No. 5 Divine Tree," which predates Confucius. Taoyuan Martyrs' Shrine (桃園忠烈祠) is one of the best-kept Shinto shrines outside Japan. The Longgang Mosque (龍岡清真寺) in Zhongli District is Taiwan's fifth mosque. It was originally built in 1967 to serve an area with many Taiwanese Muslims. Cheng Wen-tsan, the incumbent Mayor of Taoyuan. In 2001, Eric Chu of the Kuomintang defeated Democratic Progressive Party incumbent Peng Shao-Chin in the race for Taoyuan County magistrate. Peng had inherited the magistrate position after Annette Lu vacated the post to serve as vice president. Chu ran for re-election in 2005 and defeated DPP challenger Pao-Ching Cheng, CEO of the Taiwan Salt Company. In 2009, John Wu of the KMT defeated his DPP opponent, Cheng Wen-tsan and became the Magistrate of Taoyuan County. After the upgrade of Taoyuan County to Taoyuan City, Cheng Wen-tsan of the DPP won the 2014 Taoyuan City mayoralty election, on November 29, 2014, and became the city's first mayor, starting December 25, 2014. A majority of Taoyuan County residents voted for eventual winner Lee Teng-hui and vice president Lien Chan. A former RCA facility is located in the city. The RCA facility is the source of significant trichloroethylene contamination. Taoyuan is home to the Lamigo Monkeys, CPBL, team, which plays its home games at the Taoyuan International Baseball Stadium. The Taoyuan County Stadium, built in 1993, is a multi-use stadium which is used mostly for football matches and it also has an athletics track. The stadium has a capacity of 30,000 people. It is within walking distance South West from Taoyuan Senior High School Station of the Taiwan Railway Administration. The Taoyuan Arena, also built in 1993, is an indoor sporting arena located in Taoyuan District. The concept of its roof structure was based on the bicycle structure, the outer ring (to bear pressure) and inner tire (to bear tensile strength) of the bicycle wheels are connected by cable wires. It occupies an area of 1.5 hectare with capacity of 15,000 audiences. It is used to host indoor sporting events, such as basketball and volleyball. The then-Taoyuan County is also the birthplace of Taiwanese professional golfer Yani Tseng and taekwondo athlete Chu Mu-Yen. The Skytrain shuttles passengers between Terminals 1 and 2, Taoyuan International Airport. 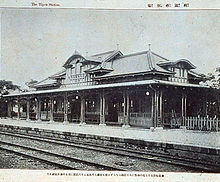 The Taoyuan Taolin Railroad is a railway branch line in Taiwan run by the Taiwan Railway Administration. It is located in Taoyuan and New Taipei City. 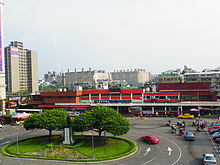 Taoyuan Station is located at the Qingpu (青埔) area, in Zhongli District. National Highway No. 1 and 3 are nearby and connect via local highways to the city itself. National Highway No. 2 connects to Taoyuan International Airport. Bridges in the city are Luofu Bridge. Taipei Taoyuan International Airport at Dayuan District is the largest airport in Taiwan. It serves as the main international hub for China Airlines and EVA Air. Taipei Taoyuan handled a total of 25,114,418 passengers in 2010. It is the fifteenth-busiest air freight hub in the world and thirteenth-busiest airport by international passenger traffic. Taipei Taoyuan International Airport currently has two terminals which are connected by two, short people movers. A third terminal is planned, and a rapid transit system currently under construction will link the terminals together underground. ^ 人口統計-桃園市政府民政局. cab.tycg.gov.tw (in Chinese). 7 March 2014. Retrieved 6 June 2016. ^ 桃園縣103年改制直轄市 名為「桃園市」. The Epoch Times. 24 April 2012. Retrieved 29 April 2012. ^ "move.htm China Airlines. Retrieved on 15 March 2010". Archived from the original on 6 April 2010. ^ "China Airlines Inaugurates CAL Park at Taoyuan Airport". Archived 14 October 2013 at the Wayback Machine China Airlines. 26 March 2010. Retrieved on 26 March 2010. ^ "Evergreen Club". Archived 31 July 2009 at the Wayback Machine EVA Air. 24/28. Retrieved on 21 May 2009. ^ "Contact Us" Archived 5 April 2009 at the Wayback Machine. Evergreen Airlines Services Corporation. Retrieved on 29 September 2009. ^ "Company Location". Archived 22 August 2009 at the Wayback Machine Evergreen Air Cargo Services Corporation. Retrieved on 29 September 2009. ^ "Asia Silicon Valley Development Agency launches in Taoyuan - New Southbound Policy Portal". New Southbound Policy. Retrieved 3 February 2018. ^ "Football stadiums of the world – Stadiums in Asia - Football stadiums of the world". www.fussballtempel.net. ^ 桃園市政府體育局. Department of Sports, Taoyuan. ^ 中壢客運─租車 包車 遊覽車 旅行社 旅遊. www.chunglibus.com.tw (in Chinese). ^ "Taoyuan-KK Friendship Pact proposed". Daily Express. 24 January 2017. Archived from the original on 16 March 2017. Retrieved 17 March 2017. ^ Mary Chin (5 May 2017). "City and cultural pacts with Taipei soon". Daily Express. Archived from the original on 5 May 2017. Retrieved 6 May 2017.